Devil's Tramping Ground, located ten miles from Siler City in western Chatham County, is a foot-wide bare path forming a perfect circle 40 feet in diameter. Regional legend maintains that Satan frequents this area on his nightly walks, pacing the circle as he contemplates his evil deeds. Normal vegetation surrounds the circle, but only a wiry grass grows inside it, and no plant life of any kind can be found on the path itself. Locals have been unsuccessful in trying to transplant the wiry grass to other soils. Visitors have attempted to anchor sticks and other obstacles in the barren area, but morning always finds these obstacles cleared away. In addition to the devil-centered explanation, numerous other theories have arisen to account for this strange North Carolina landmark. 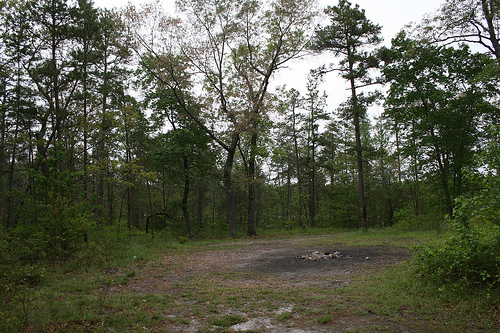 Some people believe the spot was an ancient meeting place for local Native American tribes, who made the bare circle with their ceremonial dances. Another explanation links the area to the legend of the Lost Colony of Roanoke Island. This story holds that the Tramping Ground was an area called Croatan, named for a fallen tribal chief buried there after a battle, and the word "Croatoan" carved in the tree on Roanoke Island referred to this battle site. In both of these stories, the tribal gods purportedly preserved the barren circle as a memorial to their followers' loyalty. Scientific explanations for the characteristics of the Devil's Tramping Ground have been offered as well. Some say horses used in the operations of an old molasses mill created the spot with their constant circular treading. However, comparisons to the paths formed at similar mills do not support this theory. Possibly the most plausible explanation came from soil studies once conducted by the North Carolina Department of Agriculture. Samples of earth taken from the bare path proved to be sterile due to an extremely high salt content. The remains of natural salt licks were also found in the area. John Harden, The Devil's Tramping Ground and Other North Carolina Mystery Stories (1949). Richard Walser, North Carolina Legends (1980). "Devil's Tramping Ground." Photo courtesy of Flickr user Jason Horne, taken May 5, 2007. Available from http://www.flickr.com/photos/drjason/489327902/ (accessed May 30, 2012). Thanks for visiting NCpedia and sharing your experience with us and NCpedia readers! !